This dish is the most popular type of gnocchi. 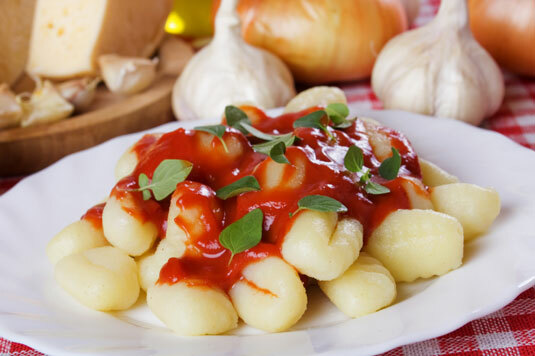 You can serve potato gnocchi with many of the same sauces you use on pasta, including marinara sauce and Meat Sauce. Use about 1⁄4 cup sauce per serving of gnocchi. In some regions of Italy, ricotta cheese replaces part or all of the potatoes in this recipe. Place the potatoes in a medium pot and cover them with cold water. Add a touch of salt to the water and bring it to a boil. Reduce the heat to a simmer and cook until the potatoes are tender when pierced, but are still firm. Drain. When the potatoes are cool enough to handle, peel them. Using a ricer, squeeze the potato flesh into a mound on a smooth, flat surface. Do this when the potatoes are still hot; otherwise, the gnocchi become gluey when cooked. Allow the riced potatoes to cool. Form a well in the center of the potatoes and add the eggs and salt and pepper. Mix to combine. Sift in 1-1⁄2 cups flour. Mix until you have a sticky ball. Add more flour if the dough is too wet to knead. Knead the dough until it’s smooth and all ingredients are well incorporated. Lightly dust the work surface with flour and then roll out the gnocchi dough so that it forms a 1-1⁄2-inch-diameter log. Cut into 1-inch pieces. Take each piece and roll it off a fork so that the grid impression remains. In a large pot, bring 4 quarts water to a boil. Add the kosher salt and a fourth of the gnocchi. Using a strainer/skimmer, transfer the gnocchi to a warm plate or serving platter about 1 minute after they float to the surface. Toss with some warmed sauce. Repeat 3 times with the remaining gnocchi. Serve immediately.